Our queen rooms offer guests comfortable surroundings and facilities for a wonderful relaxing stay. Rates are for 2 people.Free wifi,.And Lastly the best mountain views in Mt Beauty. Our comfortable twin room has 1 queen bed and 1 single bed. LCD TV and DVD player. All the facilities you need for a comfortable stay. Free WIFI And the best views in Mt Beauty. Our comfortable King bed room has LCD tv's and DVD players. All the facilities you need for a comfortable stay. And the best mountain views in Mt Beauty Rates are for 2 people only. Free WiFi. Our De-luxe Queen room has a comfortable couch and LCD 32 inch screen tv . Views to the mountains. Price is for 2 people. Give yourself a treat in beautiful surroundings. Free wifi. And the best views in Mt Beauty. Allamar Motel is close to Mt Beauty and only 40min drive to the Falls Creek ski resort in Victoria’s Alpine High Country. We offer our guests 5-star views and all the comforts of home in our 3½ star rated country style accommodation. Relax in the peaceful surrounds of this magnificent scenery while having a glass of wine or cold beer at Zak's Wine Bar. 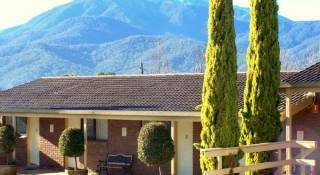 With commanding uninterrupted panoramic views of the Kiewa Valley and Mt Bogong, Allamar Motel is the perfect getaway for couples of all ages and the place to unwind amidst the landscaped gardens — a photographer’s delight! We offer superior queen and twin rooms – make sure to request at time of booking. NOTE: Strictly no open cooking, bikes or bike parts allowed in rooms. A valid credit card must be provided at time of booking and on arrival for identification purposes. Departure time: strictly by 10:00 AM. We do not offer late checkouts. If you require the room after 10:00 AM you will be required to book and pay for an extra night. To secure your accommodation, a one-night minimum deposit per room is required with balance to be paid in full on check in. The deposit will be refunded less $20 administration charges per room booked in the event of cancellation at least 7 days prior to your arrival date. Cancellation within 7 days of arrival will forfeit your deposit. Cancellation on the day or a ‘No Show’ will incur the full amount of the booking. Group bookings: A non refundable 50% deposit is required at time of booking and final payment due 14 days before arrival. Please be aware there are no refunds available if you decide to leave your accommodation early. To secure your accommodation, a one-night minimum deposit per room is required with balance to be paid on check in. This deposit is non-refundable. Group bookings: A non-refundable 50% deposit is required at time of booking and final payment due 14 days before arrival. Peak period surcharges may apply. 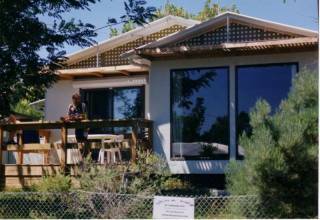 All room rates published on this website are in Australian dollars, inclusive of 10% GST. Click here to calculate room rates in your own currency. Published rates are for ‘room only’ per night, unless specificity stated in inclusions. Prices are subject to change without notice, unless confirmed in advance. Allamar Motel respects your privacy. Any and all information collected at this site will be kept strictly confidential and will not be sold, reused, rented, loaned, or otherwise disclosed. 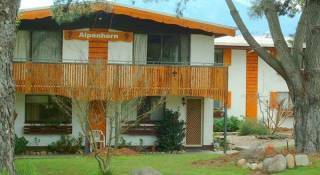 Smoking: Allamar Motel is a No Smoking motel and smoking is not allowed inside or outside the rooms. A smoking area is provided in the garden. This is strictly enforced for the comfort of all guests. Cooking: The rooms are not self-contained. No open cooking is allowed in the rooms. Bikes: No bikes or bike parts are allowed in the rooms. Extra costs incurred during your stay will be charged to your credit card if payment is not made at checkout. All bookings are made at the discretion of management. Management reserves the right to terminate any booking without refund or compensation due to unacceptable behaviour by guests. Payments made by Amex or Diners will incur a 5% charge on top of room rate. – Rooms are serviced daily with a modified service on weekends. – Rooms are not serviced on public holidays. – Guests are requested to extend the courtesy of keeping rooms in a reasonable state. – We reserve the right not to service unreasonably untidy rooms. – In the event rooms are left in an unacceptable condition, an excess cleaning fee up to one night’s accommodation may apply. Admission on motel premises: Only registered guests are permitted on motel premises between the hours of 9:00 PM to 7:00 AM. People found to be using rooms who are not registered guests will charged $100 per night stayed. This will be charged to registered guests credit card. Use of facilities: Only registered guests are permitted to use motel facilities. Car Parking: Only cars belonging to registered guests are allowed to be left in the car park, management reserves the right to have unauthorised cars towed away. Allamar is a no party motel. Excessive noise, loud music or bad language will result in guests being evicted with no refund of monies paid. All guests must respect the rights of other motel guests.